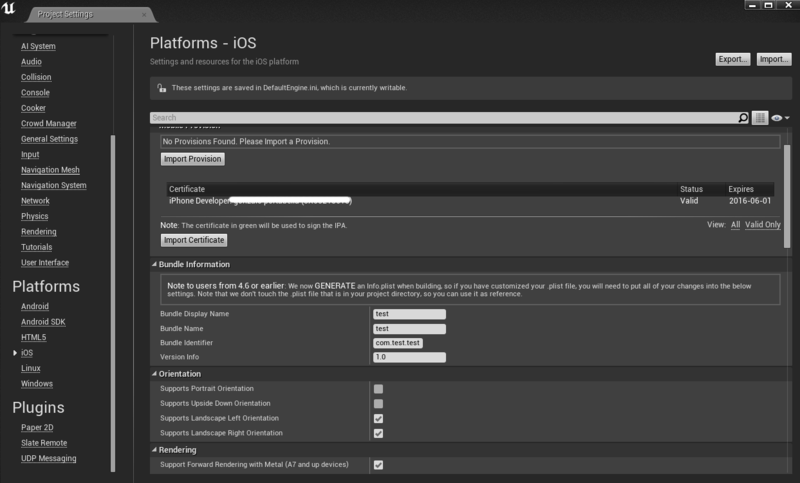 I have a provision file and a certificate but when I try to put the provision file into UE4 nothing happens (See: http://i.imgur.com/zIreZfH.png) There also should be a green valid sign but there is nothing so I tried it via the iOS Exporter. First it told me I have no UE4GAME-info.plist file in my directiory (see: http://i.imgur.com/YOS6O0x.png) and I copy/pasted the file from another pc (the file was only named info.plist). After that I got the following error: http://i.imgur.com/u5F4M0Q.png. I really have no clue what else I should do because the provison file and the certificate are certanly valid. Maybe because I have no real .plist file. Based on the log from the last screen shot, your certificate, while valid, wasn't used to create the provision that was found to best match the game's bundle identifier. Are you certain the certificate you are using was used when creating the provision?